I was beginning a career in music, but my love of climbing was a conflict. In a shift of gears which was hard for those close to me to understand, I left the trumpet behind as I turned my attention to the rocks and the mountains. I moved to California where I was surrounded by some of the world’s best climbing and climbers. At the same time I learned the craft of sound recording. My musical training and the cool head of a seasoned performer set me apart in the field. I became a music editor and later a mastering engineer. 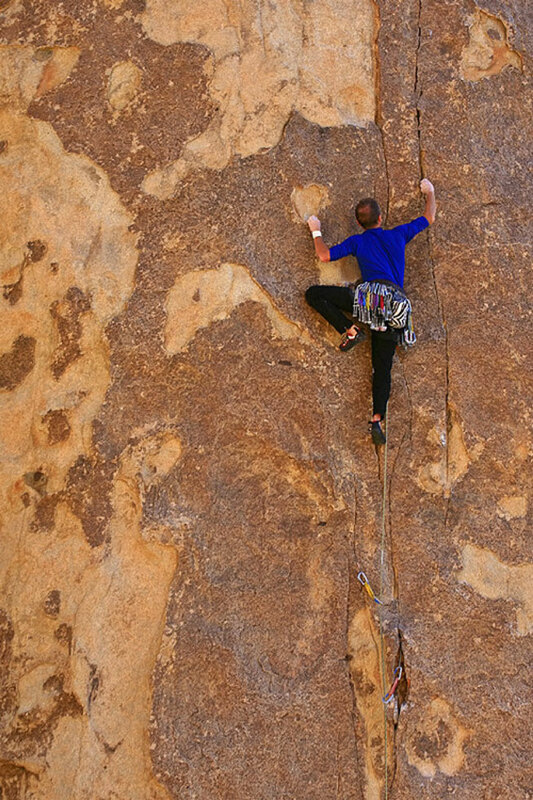 I kept my lifestyle simple and lean, and put all my free time and energy into climbing. I climbed El Capitan, Astroman, and other big climbs in Yosemite. I did first ascents in Joshua Tree and the Sierra Nevada. My love of the back country led me to climb Sequoia’s Castle Rock Spire and to establish new climbs in Kings Canyon’s wild Gorge of Despair. In 2003, at age 50, I suffered a shoulder injury. During rehab I was introduced to Pilates, which showed me a whole new way to understand my body, to build strength, and to refine my movement. I enrolled in the Pilates teacher training program at Core Conditioning in Los Angeles. I completed more than 300 hours of requirements and exams. I began teaching Pilates, and I joined the staff as a physical therapy aide. Working with the therapists at Core gave me unique insights as a trainer. 2007 promised to be a great year. But in May of that year I had a convulsive seizure. It was a terrifying and profound experience. An MRI showed a malformation 3.5 CM in diameter deep inside the right parietal lobe of my brain. It was a congenital defect called an AVM which had been slowly growing since my birth 53 years before. Neurosurgeons at UCLA Medical Center determined that I was a candidate for stereotactic radio surgery. Following the procedure I did well, but these types of remedies are never without side effects. As the AVM died, inflammation caused more seizures. I lost strength and function on my left side. The doctors saved my life with their remarkable technology, but it has been up to me – with the guidance and support of wonderful teachers, therapists, colleagues and friends – to continue to regain my spirit and physical abilities. Pilates work has been an essential part of my recovery. Photo: Kristian leading “Balance Due”, Hidden Dome, Joshua Tree. Credit, Mischa Logvinov.